The project started out simply enough for a group of Northeastern University freshmen: a class assignment to come up with an idea to improve the lives and work of service dogs that help disabled humans. 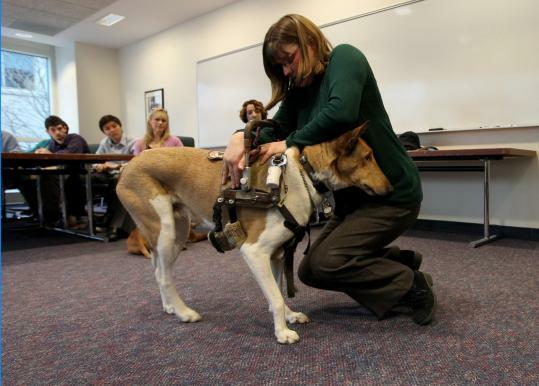 But something felt incomplete last semester when the seven engineering students handed in designs that would, among other things, relieve pressure from the dogs’ joints and help dogs pull wheelchairs in a straight line. The students wanted more than a class project — they wanted something tangible to offer the people who depend on dogs to guide their way in the dark, alert them at the onset of a seizure, and support them if they start to fall. Even though the class is over, the students have organized into a group with a faculty sponsor, mission statement, and support from the university’s Center of Community Service. Their goal is to create a product that helps people who rely on service animals. On Thursday, the students moved one step closer to turning the theoretical into the tangible during 90 minutes of hands-on research with Bronson and Jozsi — a smooth-coat collie and a copper-colored vizsla — and their human partners, executives with the nonprofit Canines for Disabled Kids. “Wow! This is awesome,’’ Hamsmith murmured after the dogs demonstrated their jobs. At 18 months old, Jozsi is still learning what to do. When fully trained, he’ll be a demonstration dog, able to do a variety of tasks and help families determine if a service dog is right for them. Jozsi was eager to show off what he knows. With his mouth, he happily picked up keys, pens, even a quarter and deposited them into the palm of his handler, Mallory Anderson. Jozsi also helped Anderson take off a coat, by grabbing one sleeve with his teeth, walking backward until her arm was free, and then repeating the action with the other arm. Then it was Bronson’s turn. Bronson is older than Jozsi, and already working; his job is to help steady Kristin Hartness Law’s gait, pick up the things she drops, and bear her weight as she sits and stands. Law, the executive director of Canines for Disabled Kids, has secondary progressive multiple sclerosis, which impairs her balance and mobility. The students peppered Law and Anderson with questions, and deconstructed Bronson’s harness, taking pictures of it from various angles. The students also got feedback about the harnesses, leashes, pet beds, and booties on the market. Bronson, for example, has a bed that provides a place for him to rest at Law’s side. But the bed is too heavy for Law to carry. Beverly Jaeger, the student’s faculty sponsor and the professor who gave them last semester’s assignment, said she came up with the idea after seeing a television program about service dogs. “I thought, since we’re engineers, how can we be a part of that in a meaningful way,’’ she said. Akilah Johnson can be reached at ajohnson@globe.com.